Kecskemet, Hungary pictures, photos. Images of the art nouveau & historic buildings to buy on line as stock photos or photo art prints. Kecskemét is a city in the central part of Hungary. It is the 8th largest city of the country, and the county seat of Bács-Kiskun. 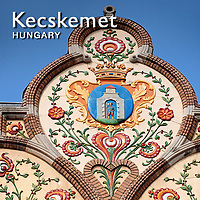 Kecskemét lies halfway between the capital Budapest and the country's third-largest city, Szeged, 86 kilometres from both of them and almost equal distance from the two big rivers of the country, the Danube and the Tisza. It is the northern of two centres of the Hungarian Southern Great Plain (Hungarian: Del-Alföld) region (comprising the three counties Bács-Kiskun, Békés and Csongrád); the southern centre is Szeged, the seat of Csongrád county.